I'm having some problems with my camera battery, so instead of roadtrip photos, it's just more socio-political observations about Montana today. We stopped for breakfast in a little village with the very English sounding name of Dutton. We were surprised to discover: a playground with picnic tables and what look like reservable barbecue facilities, a sports field and a pool. I've been complaining for weeks about the lack of public facilities in the US and I was very surprised to see all ths in such a small place. Then, at the entrance to the playground I noticed the sign saying it was built using funds from the government's recovery scheme. Look everyone! Your tax dollars do work! Here is a very nice thing that everyone can use. Too bad there isn't more stuff like that. 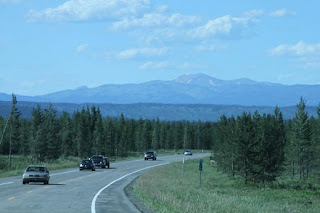 All the same, as we were driving to Glacier National Park, Montana looked quite well off. It's mostly empty, but the farms are pristine and orderly in a way that reminds me of the Dutch and Scandinavian countries. Then, all of a sudden we passed through what seemed to be a shanty town with a pretty American flag flying over it. And then another one, then fields with ramshackle cabins. I was changing my mind about Montana, and I suppose the fact that I later realised the 'poverty line' coincides exactly with the Blackfeet Indian Reservation does not alter matters one jot. It's a beautiful bit of landscape though. We arrived at Glacier to find all the A campsites filled with Canadians on some bank holiday weekend we didn't know about. We just managed to get in at Cut Bank campground. There are no facilities or water here, but we like it anyway. Antonia is feeling homesick, maybe because it looks just like home. There is something strange about driving down the Interstate for seven hours trying to work on a laptop in the back of a campervan. Time passed quickly, though trying to line up the mouse with the pixels was a headache. There is also something peculiar about pulling in to a motor inn in the middle of an unknown town for two nights, intent on getting as much work done as possible. The rooms in the O'Haire Motor Inn are so neutral, I can hardly think of a thing to say about them, except perhaps that they tend towards the old-fashioned kind of neutral. O'Haire Motor Inn does have its touch of wild eccentricity though. 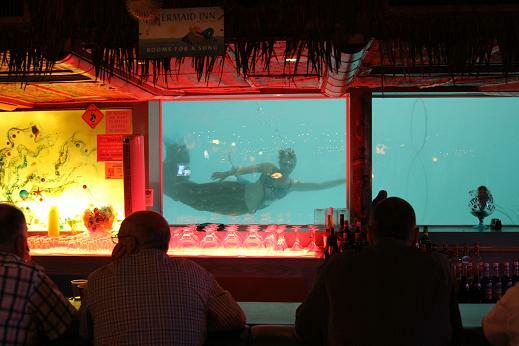 On one side of a wall is a small swimming pool room with views over a pawn shop and a motor repair shop. It has a very industrial feel, as if it had been installed in an abandoned factory or warehouse. Since that's the kind of environment of lots of postmodern art exhibits, that's what it reminded me of - a postmodern art installation. It's a similarity that's exacerbated by the echoing acoustics. The four or five large, hairy (or made-up, according to gender) and tatooed people sharing the pool with Antonia are either speaking a dialect of English I can't understand or playing at talking nonsense, and I can't tell which. On the other side of the wall is the Sip 'n Dip bar filled with kitsch trinkets of various kinds, roofed over with bamboo like a Hawaiian beach bar, carpeted with something featuring multi-coloured bubbles and furnished like a Hopper painting. It sells cheap martinis and very good desserts and is obviously popular with tourists and locals alike. To get in, you have to show your identity to a heavily-built doorman even if you are clearly in your 40s like us, and get a paper bracelet just like in a hospital. There are windows in the wall between the bar and the swimming pool, beneath water level, and every Tuesday to Saturday night a girl dressed as a mermaid comes and performs acrobatic swimming in front of the bar windows for an hour. At 9pm a lady arrives to play the piano and sing racy songs. She's been playng here since 196?. Our second evening in Great Falls was more mundane. I spent an hour in Barnes and Noble, enjoying looking at books and then we had dinner at Pizza Hut. It is sort of impressive to think that no matter where you go in the US, you can have an experience like that. I like hanging around Barnes and Noble and I was quite impressed with the range of viewpoints in the books on offer, even though there is something about this whole region of the country that I can't quite put my finger on. It's like the feeling I get when I'm visiting my parent's village It's perfectly nice and I don't mind spending time there, but... I think monocultural is the term I'm looking for. And I can't live with that. OK, so we did make a little cultural discovery this evening, while reading the news on Mike's cell phone in Pizza Hut. It's not often a newspaper article makes me reach for the dictionary but apparently when the House of Commons 'tables' a motion in London, it means they'll keep on hurling insults at each other until a solution appears. When the Senate 'tables' a motion in Washington it means they are going to refrain from talking about it and go and have a drink in the hope it will have gone away by Tuesday. This is really a working trip for all of us, but due to force of circumstance the last month hasn't been extremely conducive to getting work done. We're spending our last two days in Driggs catching up a bit, just going on short walks and soaking in the hot tub in the evenings. Antonia and I went to explore the Teton Valley Museum and saw lots of Laura Ingalls Wilder type stuff for real. What we liked best were the quilts and the cattle branding signs. People often made quilts by sewing a square each and then stitching all the squares together. It's interesting to come back 100 years later and still be able to see their individual tastes and personalities in the quilts after they're all gone. We also had to change our plans for the next couple of days. We can't really afford the time to hang around Glacier National Park until the weekend and we can't all work in the campervan. So we've booked a motel in Great Falls, Montana for 2 nights. Why Great Falls? Well, it's on the way to Glacier but the hotel prices aren't as high as they are near the park. And I thought it might be interesting to see what a medium sized town looks like. Other than that I don't know a thing about the place, so it will be an adventure... We have to stay 2 nights so that Mike can get a full day's work in. Driggs is a town built around a cross-roads, but with houses scattered sparsely throughout the valley all around it. For a place that's supposed to have a population of 1000 people, it has a lot of shops, but I think part of the reason is that there's a big seasonal influx. Most of those scattered cabins are holiday homes or rented out, like ours. A lot of the shops are for fun things like outdoor activities. When I went for a stroll around I found my first impression that people are pretty nice here was justified. They also take things nice and slow. There are places in the world where people just talk fast, but here it's the opposite. In the bookshop, the lady broke off a conversation about bears to give me a gift pack containing some special offers and three sweets. The local teenagers seem more concerned with vampires than bears judging by the whole shelf of vampire books on offer to them. But in the cheese shop, the ladies broke off a conversation about bears to thank me profusely for buying cheese from them. In the newspaper that came with our house the front page headline is about a local lady who was chased by a grizzly while riding her bike, more or less in a residential area. Suddenly, everyone is remembering every bear story they ever knew! Mike had told me to go to the sports shop to find out how much bear pepper spray costs. It comes in an aerosol can with a holster for about $60, which seems like quite a lot. It is a big year for bears around here. There was one by the side of the road in the Tetons this weekend, and as usual, a traffic jam had formed around it and a whole crowd of people were slowly sneaking towards it with their cameras, but in a jittery sort of way, as if they were all ready to run back to their cars. There is one big supermarket in Driggs which I was surprised to find stocked everything we could possibly imagine wanting, in organic and non-organic versions. It's always kind of fun to go round the grocery stores in foreign places and see what they've got. The big thing out here is huckleberries, which turn out to be the same as the French myrtilles. I never knew that. They make just about everything except tarts with them here, (even barbecue sauce) but they're expensive. The only snag with the afternoon was having to pay for the shopping on my French card, then a phone call to the US credit card company to remind them that we are traveling! What I like about the kind of travel where we stay in a house somewhere is that we can combine the best of ordinary life with the best of traveling. We can do all those Sunday things like stay in bed very late, eat home-cooked pancakes and maple syrup for brunch and eventually wander off to some place close by for a little walk. That's where the adventure comes in. We drove up to the Targhee Ski Resort and Antonia formed a plan to climb the highest hill in the place and reward herself with a free ride down on the chair lift. The only problem was that we were going to have to make good time up the hill to catch the chair lift before it closed. I suppose ski lifts and ski run signs all over the place is not everybody's idea of a wilderness, but coming from a ski area ourselves, it had a homely feel. The trail was steep enough to raise my endorphin level (which seems unusual for an American trail) and the elevation was high enough to cause all of us to struggle intermittently. We had plenty of time to notice how much Antonia is growing up. Not only does she make plans for us, not only does she want to charge us 50c for foot rubs (a service previously offered for free), but she now climbs mountains faster than us as well!! We earned our reward and the chairlift dropped us down opposite the Branding Iron cafe in the middle of a bike festival and a gig by a local band, the Jet Black Ninja Funkgrass Unit. They are truly excellent so we really got lucky there. After that we ended the day perfectly by getting home in good time to cook Sunday dinner, lounge around in the hot tub and watch James Bond movies. I believe in planning, and right now we're experimenting with officially planning our days. So yesterday, we set off to do a 13 mile hike to Lake Solitude in the Grand Tetons but just failed to reach our goal due to lack of planning. Ooops! Here's all the things we should have done. I could imagine they're obvious to everyone else, but just in case. Figure out how long it will take to get to the trailhead (and back again). Don't just guess, use Google Maps or something similar. Actually what went wrong yesterday is that Mike thought the hike was on our side of the Tetons so when I told him it would take more than an hour to get to the trailhead he treated that information, shall we say, lightly. I knew where the trailhead was but I didn't know that he didn't know! Not only did we set off late, but we ended up doing a few unplanned errands on the way. Being an hour late made the difference between reaching and not reaching the lake. Figure out any time constraints. Yesterday we were using a shuttle boat which returned from the trailhead for the last time at 7pm. That was a pretty absolute constraint that forced us to turn back before the end of the hike. Even that put us back at the house later than I'm really comfortable with but I lived with it. Time constraints can also occur in the middle of a hike. For example, if we're climbing a mountain, I find it important for digestive and motivational reasons not to eat lunch before the top (especially for a child), but then again, having lunch at 4pm doesn't work either. Get all your stuff ready in good time. There is quite a lot of personal leeway here. If you want to get up at 3am to make pasta salad, launder your hiking socks and pop down to the all night gas station to buy essential trail snacks, nobody can tell you not to. They can tell you you need to be at the agreed start time and place, no excuses (bar genuine emergencies). Similarly, if you intend to hike in a tee-shirt even if there's a blizzard, that's up to you. You're just responsible for not forgetting to bring things that are very likely to be needed and compromising everyone else's day, let alone safety, because of it. So here's the last rule. OK, so nobody in our house has gone to quite such extremes, so the above is literary license. Know about local conditions. One thing we've researched around here is bear awareness. We're just not used to having to deal with large mammals other than humans. We are used to mountains, but yesterday we ended up hiking about a mile over more old snow pack than we would expect at this time of year in the Alps. We weren't really equipped for that, although all the other conditions were so nice, it was no problem really. Antonia even had a spare pair of shoes with her (because her Dad insists she shouldn't hike in sandals, but she intends to do so anyway). But I do know of a lot of situations where lack of local awareness has killed people, so it's not really to be taken lightly. All over the place in the west, I've seen signs advertising rodeos. There's a rodeo every Friday night just round the corner from our house, so Antonia and I decided to go and see what it's like. Mike decided he wanted no part of it. He should have come. We found a place on the benches next to some people I would have sworn were tourists from the way they were dressed (i.e. not like cowboys). It turned out they were from as far away as Idaho Falls (1 hour). The woman was from the area and had dragged her husband along, much against his wishes. He looked about as comfortable as a cat on a hot tin roof. Mike and he could have commiserated together. He kindly explained some of the events to me anyway, but he really wanted to make sure I knew that the people around here aren't quite the primitive rednecks he thought they were making themselves out to be by participating in rodeo! He told me there is a lot of wealth and nuclear technology going on in Idaho to counteract the impression I was surely forming. I tried to let him know that in the South of France where I grew up, we have no problem at all combining engineering expertise, bull games, and thinking ourselves reasonably sophisticated, but that idea seemed to be too far away from his own for him to even register it. The kid riding here is about 12. He did really well, but the calf caught him in the stomach with its hoof after he was down. People do get knocked around in this sport. All stand for the national anthem, a prayer and an injunction to remember the armed forces (I have started to realise that all this stuff is par for the course)! Running commentary throughout the events from a couple of guys in the crow's nest. As soon as I got familiar enough with their accents to understand what they were saying, I discovered it consisted of some a pretty pathetic series of jokes and jibes which everyone ignored. There were a few other things after that, but we'd already stayed two hours and needed to get home to get up early for a hike the next day. We both had a fabulous time. I had to lasso Antonia, throw her on her back and tie her ankles to get her away (just kidding!). My first ever baseball game in which the Phillies won of course!! The Philadelphia Flyers embarrass me by pretending they can play ice hockey, but OK, I'm including the experience anyway. When I was planning this trip, I really wanted to spend time in Yellowstone, and coming to the Grand Tetons was a second choice because Yellowstone was just too full. Beyond that, coming to the Idaho side of the Grand Tetons was a second choice, because the Wyoming side is very expensive. Well, boy did I get lucky! Just the drive through the Tetons was more impressive and beautiful than anything Yellowstone had to offer. Then we arrived in Jackson, which although it is touristy, is at least a real place and not one of those artificial National Park villages. Finally we arrived at our 'cabin' in Driggs which Antonia promptly announced was the best place in the world apart from our own home in France. I can see her point. Firstly, for a cabin, it's so big I have no idea where the other two are right now, which has its upside after spending about 4 weeks sharing rooms and a campervan. Secondly it's full of all kinds of fun and interesting things selected by someone else. I can't help a secret wish that it would rain for a week so I would have an excuse to spend all day watching someone else's old James Bond movies and reading their books. Thirdly, it has lots of essential facilities. For example, every stitch of clothing I own is currently in the washing machine, so it's absolutely essential that there should be a hot tub for me to sit around in until I have something to put on! The fact that the hot tub has this little tablet thingy where I can rest my laptop is a bonus. So really, we all wish we were staying here longer than a week, but as it was a bit steep for our budget in the first place, so we'll just have to make the most of the time we've got. As a town, Driggs is even more real than Jackson. It's touristy enough around here that there are lots of nice facilities, but it's also a place where people live. Last night, we didn't have time to go food shopping so we ended up in Teton Thai, the most amazing Thai restaurant we have eaten at in a long time. Apart from the food being excellent, it's one of the few American restaurants I've been to in which you can hold a conversation without yelling even when it's full. You can order food with a spice level ranging from 1 to 5, so we ordered 5. They were not kidding when they said it would be spicy. I was in heaven (though inevitably I had to die first in order to get there)! Antonia ordered Pad Thai without any spice, ate half of it, then told us she found it quite spicy. Mike agreed with her and mentioned it to the waitress, so they gave us a whole new Pad Thai even though it's not as if we had failed to eat most of the first one. So, it seems the people around here may also be nice beyond the call of duty as well... not like in Yellowstone, let me tell you. Plan your day to include as little driving as possible. Take walks through flowering meadows and young conifer woods (there was a big fire here in 1989, so no old forest), passing blue ponds, streams and waterfalls. Several trails start or end in geothermal areas which is a good way to see those. Find a bison to look at, but without getting too close. Play at scaring yourself that a bear is going to come and join in your picnic. Watch the squirrels, chipmunks and groundhogs beg pathetically to be allowed to join in your picnic and say very rude things to them while refusing. Stay at Mammoth Springs (it's much nicer than Old Faithful). See the lobby of the Old Faithful Inn, even though it involves putting up with the madhouse that is the Old Faithful area in July. See the Old Faithful geyser go off from the viewing platform of the Old Faithful Inn. Try out the cocktails in the bars or restaurants of the main park hotels. Have dinner in the restaurant of any of the main park hotels. Bonus game to play: see how many people you bump into from your state/country, or see if you can spot a license plate from every US state. Try to do drive and stop touring of the main geothermal areas, along with everyone else. Forget to take warm and waterproof clothing with you when going on walks. Get caught in a traffic jam caused by people trying to look at a bison. Have a bear come and join in your picnic for real. Have a chipmunk unexpectedly climb up your leg in its determination to beg some of your picnic. Set foot inside the Old Faithful visitor center. Look at the ridiculous assortment of hokey souvenirs in the park 'general stores'. Let your hat (or other personal items, such as children) blow or fall off the boardwalk into the geothermal areas. Try to make picnics day after day from the pathetic and unhealthy assortment of ingredients in the park 'general stores'. Be in a hurry while trying to get seated and served in one of the park's restaurants. Bonus game to play: keep track of the most appalling instances of rudeness and arrogance you encounter from staff or from your fellow visitors and pin them in an album to tell your grandchildren. The desert parks of the south-western United States are so well known internationally, that it's a little bit strange that the north west isn't equally well known for volcanic and geothermal tourism. Except for Yellowstone. Mike and I have done a lot of volcano tourism around the planet, which puts us into a position to make comparisons, so I think I'll deal with Yellowstone first. In terms of what we've seen, Yellowstone is only just interesting. For example, we saw Old Faithful go off, and it was very pretty, but even Antonia remembered that it was not as impressive as Strokkur (I think) in Iceland. She said so in quite a loud voice as well, which wasn't very tactful of her. I could feel the people all around us having palpitations. As for the colored pools and bacterial mats, they are nice enough, but they are a long, long way from being as impressive as the ones we saw in New Zealand. In Yellowstone, there are also far too many boards around, telling you that the thing you're looking at was quite impressive in about 1870, but is now a dud. I can always look at more volcanic activity quite happily, but so far, seeing a real live bison has been the most exciting event for me. Given that Yellowstone rates a B- in terms of geothermal activity, it's a shame that it's quite so much of a pain in the rear to visit. It's absolutely a circus here in July. You have the opportunity to stand in a traffic jam caused by people who have left their cars in the middle of the road to go and photograph a grizzly bear on the verge. You can watch people destruct test their children by seeing if they can navigate a narrow boardwalk between two boiling hot geothermal pools without falling off (they can't). You can hang out in the Yellowstone Inn of an evening listening to people sing the lowest common denominator of song around the piano. The rangers here are the least friendly and helpful of any park we've been, probably because they're confronted with the reality of having to process thousands of people who are just passing through. The Yellowstone Inn has fascinating architecture, but as everyone says but it's also a pretty rough and ready place to have to stay. It's staffed by overworked kids fresh out of high school on their summer holiday jobs, and the least expensive rooms are really just about hostel quality at $99 a night which turned out not to include room service. The best thing about the Yellowstone Inn was the restaurant. The bion ravioli, antelope sausage and everything else I had were amazing, though as at Yosemite, the portions, prices and speed of service are European style. We have mostly been concentrating on the scenery, which I'll hopefully post about tomorrow. Volcano tourism in Oregon is a lot more fun. Crater Lake can also be a bit of a madhouse, but it's a small park and you would tend to only stop by there for a half day on the way to somewhere. It really is extremely beautiful and worth a little detour (maybe not a huge one). 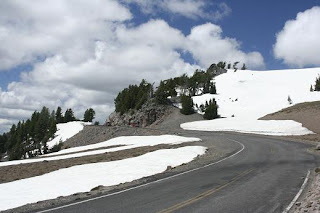 The first time I went to Crater Lake, Mike and I drove on and spent a whole weekend visiting the Newberry National Volcanic Monument near Bend. That's where I went down the very best lava tunnel I've ever been in, Lava River Cave, about a mile into the ground, with the help of some very old-fashioned kind of fuel-based light. I wonder if they still do that? This was my first ever volcano tourism trip, so maybe I've become jaded in the meantime, but I have very fond memories of it, and there are a lot of things to see in Oregon and Washington state that I haven't seen yet. On this trip, we stopped at Craters of the Moon National Monument in Idaho off Route 20. Not only did it have a pleasant campsite, a reasonable number of people and ultra-friendly and helpful rangers, but it was enjoyable volcano tourism in a small scale way. You can see a lot of different and interesting things here in a full day: go down a small lava tunnel, climb a small volcanic cone, traipse through a lava field. We only had half a day, so we even had to be selective. It wasn't quite a monumental as being up near Myvatn in Iceland, but it was a nice enough place to be that this wasn't a problem. I am behind with a few blog posts, but Mike and I are feeling so smug about something in particular that I have to post about it quickly. Here I am on the porch of my cabin in Mammoth Springs, Yellowstone, writing a blog post. Just this morning, I was browsing the net from the viewing terrace of the Old Faithful Inn, waiting for Old Faithful to go off. And yet everyone you ask will tell you there is no internet in Yellowstone. So how does this work? Frankly, I don't know, so I'm going to interview Michael. Pen: Mike, how are we getting our internet here? Mike: From Verizon Mobile Internet. Pen: How does that work? Mike: We bought this device called a MIFI which acts as a wireless router and connects to Verizon's 3G-4G wireless network. You plug it in and it works just about everywhere. We've had internet on the train across country almost constantly, in the National Parks and up the Pacific Coast. Frankly, it's astonishing the number of out of the way places we've had internet access. We're even running our phones off it. Pen: Can we really get internet all over Yellowstone? Mike: No. It seems to be only in the villages. And it's often pretty slow. Pen: So when we drove into Mammoth Springs, you were freaking out because you said there was no internet and you had to talk to someone? Mike: It seems that it depends where in Mammoth Springs you are. Maybe we have a better view of the tower from our cabin. Pen: How much is this internet stuff costing us anyway? Mike: It costs $50 a month for 5 GB of transfer. Pen: Did we have to pay for that MIFI device as well? I guess that's OK for a business expense. Though I have to say, it's a bit slow here at Mammoth Springs and sometimes it refuses to download pages for a while, then it will - as you can see. Basically, it's a whole lot better than nothing. So while Mike is talking to someone tomorrow, Antonia and I will be enjoying the lovely surroundings of Mammoth Springs, which frankly are a lot nicer, more peaceful and just BETTER than the surroundings of Old Faithful. This is probably the most fun I've ever had on a roadtrip. I can't recommend Route 20 between Bend, OR and Yellowstone Park enough, especially for foreign tourists who aren't used to empty American spaces and long straight roads. Nowhere in Europe can you find a single lane road that's this driveable and empty through such wide open country. Just ignore the little bit of interstate near Boise. Thursday 14:51, We've already come from Talent to Crater Lake where we had the fun of seeing snow as well as the lake itself. Thursday 18:40, Still open road as we head across Eastern Oregon, but now there are no trees. I don't know when we've ever made such good time on a roadtrip before. Thursday/Friday night, Our campsite is in a pretty meadow on the outside of Hines and Burns which is the only real civilization for miles and miles. The campground has a wholesome feel but the counter in the office is covered with Bible verses and the chap who assigned us a place turned out to be from the East Coast near where Mike's dad lives. He moved out here so he "could stay out of jail", which begs the question: are there fewer opportunities to do things that get you jailed out here or just fewer opportunities to get caught. Friday 10:15, We're just entering the Malheur River gorge, which didn't at first sight seem to deserve its name. Friday 12:31, Around the town of Vale population densities reach something like European levels and the farmland looks equally dense and prosperous. We went to the one supermarket in town, and found that they sell saddles in the parking lot. Since Mike and Antonia decided to picnic in the van, I crossed the parking lot, discovered that the grass lining the car park was made of plastic, crossed a little road into a sort of small picnic area and read the exhibit about the Oregon Trail. I found out that the poor devils on the Oregon Trail really did think that the Malheur river deserved its name, perhaps with good reason. It's actually quite impressive what the area has become. Friday 14:18, We're on the Interstate for just a little while around Boise. Friday 15:41, Back on route 20 again, and enjoying more big roads. We pushed on to Craters of the Moon National Monument and made our first camp dinner under rainy skies. Saturday 11:44, Since for once in our lives we're ahead of schedule, we had time to spend the morning visiting Craters of the Moon. I'll hopefully do a post about volcanic tourism later. Saturday 14:17, Arco has a strangely decorated mountain. We don't know why. Saturday 18:10, This is some kind of ancient nuclear power station in the middle of nowhere in Idaho, that Mike wanted to visit..
Saturday 20:07, we're nearly in Yellowstone and back in tree country. We didn't realise quite how tired we were till we arrived and discovered that we were pretty confused about both the date and time, and incapable or responding coherently to people. Ashland is a town famous for its big Shakespeare festival and my mother-in-law had got us tickets to see Love's Labour Lost in their Elizabethan style theatre. It's very similar in shape to the Globe in London, but all modern. It turned out we had very good seats because it rained on and off throughout the show and everyone in front of us got wet. Love's Labour Lost is one of Shakespeare's more intellectual and cynical plays, before he really got into the flow of being deep and meaningful. All the same, I quite enjoy it, especially this very professional production. It was well acted, funny and really everything about it just worked. The people here take Shakespeare very seriously, I have to say. They have a whole gift shop attached to the theatre, full of Shakespeare fridge magnets and stuff like that. The lady next to us in the audience was very serious. She didn't like me whispering plot cues in Antonia's ears, but she made quite a lot of noise herself. The more Shakespeare was sarcastic and cynical, the more she ooooohed and aaaaaahed and mmmmmmed in ecstasy. It's not often British humour gets a response like that in these parts, I can tell you. I came to the conclusion that the whole thing washed completely over her head. Mike and Antonia going in to the Elizabethan theatre, which we're not allowed to photograph, probably because it's been copyrighted. My mother-in-law already told me that the people in Ashland were a curious bunch, but I got more confirmation the next day when Mike and I went in to potter around. There are lots of little restaurants overlooking the creek and Mike and I had excellent pizza on a terrace at Creekside pizza bistro, which seemed to be the local hangout for the goth-type kids. We wandered around various gift shops and into one that seemed to have been stocked by the most cynical person on the planet after Shakespeare when writting LLL. It was full of dark humour, often connected with Shakespeare, but also a shop assistant who was well... people who know Wodehouse will know that when he wants to show that the intended fiancee is a couple of slices short of a sandwich he shows her sneaking up behind someone, covering their eyes and crying 'guess who?' I swear that is what this shop assistant was doing to her colleague. When that fell flat she began waving around ridiculous gifts and suggesting that some other colleague might reaaalllly luuurve them. It was quite a performance and every other shop seemed to have an equally crazy shop assistant in it. It was as though the whole town was on some kind of drug, and they probably are. Mike reminded me that this isn't called the land of fruit, nuts and flakes (or bananas, as we say in British) for nothing. Now I'm reading the well-named Complete Idiot's Guide to Golf (see list in the side bar), just so I know what I'm supposed to be doing in case I ever meet anyone who wants to take me to play golf. I'm not sure that Mike is going to be that person. Instead of this, I somehow drifted into cleaning and reorganising the campervan which very much need doing, and took all day. After a while, I went for a walk and met a guy with two dogs who told we where the best local hikes are, and also that Mount Shasta, some way to the south of here is thought to be one of the Earth's seven chakra points. He said if you go up there, you run into some pretty interesting people. I can just imagine a RTW trip for Earth-chakra followers. A bit of Americana by the side of the road. There comes a point when you're staying in a foreign country where you decide that enough is enough and that you are going to do things your usual way, no matter what. For example, Antonia and I once went to Pizza Hut in Indore. It was the same impulse that made me decide to walk the three miles into the little town of Talent, Oregon, potter around a bit, have a pint and walk back again... well, I might have a glass of something Californian instead of a pint. There are no little footpaths between each field and garden, linking every individual house to the nearest pub, so I had to take the road. Also, my host had given me detailed instructions on which coffee shops are the best, which was a bit disconcerting. Fortunately, the road isn't too busy, the view is amazing and there are lots of Californian poppies and pink and purple vetch growing through the asphalt at the side of the road. Talent has a population of 7000 people and they must be fairly cultured because they have: a movie theatre, a regular theatre, a sculpture gallery, a flower shop and a picture frame shop, a used paperback book shop and a scuba diving shop (the coast is at least 2 hours away) and several restaurants. They do have a few practical things like a small supermarket, a laundromat and drive-through pharmacy. They have a wide range of churches, and at least five coffee shops. One of the churches is so pretty, I am threatening Mike I might join it. They do not have a pub, and only one rather dubious looking bar. You can walk round the whole town in about 10 minutes, although everybody else drives. Everything shuts down at 3:00pm on a Saturday afternoon, which was too bad for me, because I thought it would stay open until 5.:00. I resigned myself to going to a coffee shop, just as my mother-in-law drove past us with Antonia so she was very fortunately able to take us to the best coffee shop that was still open. Given that it's summer, most of the coffee shop's drink list consists of iced coffee or iced tea. Every church in town will be preaching Richard Dawkins from the pulpit before I will drink iced coffee or iced tea so I had a peach smoothie which was excellent. Mike had iced Indian Chai with extra spices!! You can really tell he's a native. 12:54 pm: Mike had to catch up on some work so we left about noon. Antonia and I are fascinated by these little houses they have all along 19th avenue in San Francisco. They are like mews with a garage underneath and a flat on top. 1:07 pm: We crossed the Golden Gate Bridge under some of that shredded floating fog that San Francisco is famous for. 2:39 pm: This is Muir Woods, a National Monument to the Coastal Redwood tree. We got lost looking for it, so by the time we got there I had reached the stage where I had protected myself from disappointment by convincing myself that it didn't matter whether I was looking at redwoods or a parking lot. I felt better after a walk and some lunch, but it was crowded here and hard to park (beautiful, though). 4:51 pm: This is near the start of Route 1, the Pacific Coastal Highway. It's very attractive and gratuitously winding. On road like this, we plan to drive nearly 200 miles, plus another 200 miles on slightly faster road. The fog is already rolling in, as it does on the Pacific Coast as soon as the sun is no longer powerful enough to burn it off. 7:15 am: Next morning, it is still foggy and we've just left our campsite in Bodega Bay, where we camped in the fog, to the accompaniement of a foghorn blaring once every 47.5 seconds. Bodega Bay is about 60 miles north of San Francisco. We really ought to be in Eureka by now. 9:23 am: Once the fog has lifted, Route 1 is certainly beautiful. We are starting to look for a beach to stop and eat breakfast on. 10:45 am: The only way to really get on the beach here is at the state beaches and parks. This is the first one we found that was right on the road. Mike spent the time chatting with some Californians who were testing out their antique campervan. Antonia is drawing seagulls and making careful notes about their behaviour. I was guzzling down coffee. 1:21 pm: This is what grocery stores look like out here near the junction of Route 1 and 101. They sell everything: hunting licenses, live bait, 15 kinds of beef jerky, and, since this is California, relatively healthy lunch food. It was high time we stopped. I am not used to driving an automatic car on these windy, hilly roads, and the brakes were starting to smoke. I think I averaged 35 mph, by the way - and nobody was passing me! 1:50 pm: This is 101, which is a whole lot easier to drive on than 1, and also very pretty. I am trying to nap in the back of the van, Antonia is in charge of photography and Mike is driving. 2:02 pm: Mike told Antonia to photograph some redwoods. I like all the bits of car that appear in her roadtrip photos because she is so small. 6:57 pm: This photo looks about the way we feel, but it does have one redeeming feature: it says 'Welcome to Oregon' on it! 8:21 pm: That's Mount McLoughlin over there in the distance, and more importantly, that's Interstate 5, down in the bottom of the frame. Boy, were we glad to see I 5. If it was possible to stop in the middle of an interstate, there would be a picture here of me, Mike, and Antonia kissing I 5. We are ten minutes from our destination and as soon as I arrived I was on the 'net trying to figure out how to drive from here to Yellowstone using only interstates. I expect I will feel more adventurous in a day or two.